At about 6:30 p.m. on Saturday, people began reporting two plumes of smoke on a hillside off Highway 58 outside Santa Margarita. The flare ups did not threaten any structures and no injuries occurred. Because of the high temperatures and winds, burning tree root systems ignited trees that hadn’t fully burned in the Cuesta Fire. Fire crews worked through Saturday evening mopping up hot spots. Cal Fire crews continue to monitor the area. The Cuesta Fire was started in mid-August by sparks from a truck pulling a trailer. 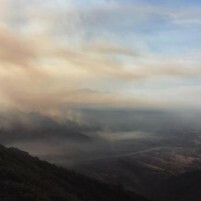 It burned at least 2,446 acres in and around Santa Margarita.